The New Blood Suckers II Slot is Now Available - Try it For Free! Due to the popularity of the original Blood Suckers, a sequel was unavoidable, since no doubt that this classic, favoured for its high RTP of 98% deserved a follow-up. Blood Suckers II is the result of improved sound effects and perfected graphics combining to boasts an enhanced gaming experience. 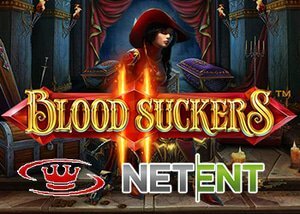 The New Blood Suckers II slot from NetEnt excites with 25 paylines that are fixed and draped with masterfully created vampires, vampire trackers, steel encrusted gemstone and demons, while five reels are transformed into a bloodcurdling atmosphere enriched via perfectly elected audio effects. Crammed with special features vampire fans can look forward to additional winning possibilities from substituting wilds, scattered red roses, blood rose free spins, hidden treasure bonus game and random features such as the bonus shot & scatter shot feature. During the hidden treasure bonus game, scattered roses are collected. At the end of the bonus round, three or more scattered roses will activate 10 Blood Rose free spins. This feature can be retriggered by three roses during the bonus round, and all payouts during the free spins are multiplied by 3. Players eager to enter the next stage need to find a key decorated by a blood red ruby, should the key be revealed at the last level the great treasure is found and players awarded a win of 1,000 times the wager. The hidden treasure bonus round ends once the demon shows up. The maximum win during the hidden treasure bonus round is 16,750 coins. Perfect for the bloodthirsty, Blood Suckers II is bound to satisfy any winning desire with its impressive 10,000-coin jackpot, while the RTP is 96,94%. Amelia, guards the reels with her crossbow, ready to slaughter the beasts of the night. Assist Amelia to fulfil her wishes and earn rewards anyone would love to sink their teeth into. Ultimately the goal is to make it through all five bonus stages once entrance is gained into the secret chamber, which not only will give new oomph to spinning confidence but to any bankroll. But will you continue to the vampire castle, even now that that warning is out that a new generation of vampires is lurking around? Players eager to enjoy an unforgettable gaming experience can now claim a NetEnt no deposit bonus worth $10 at Casino Luck, home to one of the biggest selections of slots including all the latest and most popular NetEnt games.